Comments: Some early Tremolux cabs were fitted with a 1 x 12″ baffle. This is actually a blackface recovered in blond. Thanks for the comment! Would you happen to know where i could get a real photo of the blonde version? Barry.Will a pic of a brown face blonde tolex marron/oxblood grill export version do ? Fully stripped down at the mo pending a service. I’ll email you a photo of mine if you like. which detail are you looking for? Barry – sorry, but your mistaken. The photo is correct…a 1961 Tremolux. Easy mistake though… The picture here is a 1961 6G9, using two 6BQ5 tubes. Only made one year. Check your schematic. The 6BQ5 6G9 circuit did NOT have a presence control. How can I figure out which circuit number I have? And how can I verify that I have a ’62? Thanks, Ed. You can probably remove your chassis and find some information somewhere on the underside. None of the Tremolux Piggy backs used a presence control. You are thinking of a Bassman. The 6G9 uses 2 – 6BQ5 power tubes, and does have a standby switch. The 6G9-B uses 2 – 6L6 tubes, and does not have a standby switch. Blackface uses 2 – 6L6, with standby. Mine has a standby switch, and 6L6’s, and a tone ring cabinet. There is no tube chart. But with vintage Fender, anything is possible. To Barry, none of the versions of the 6G9 Tremolux have a Presence control. I have owned a 6G9B and currently own a 6G9A with tone ring cab and neither of them had a presence control. 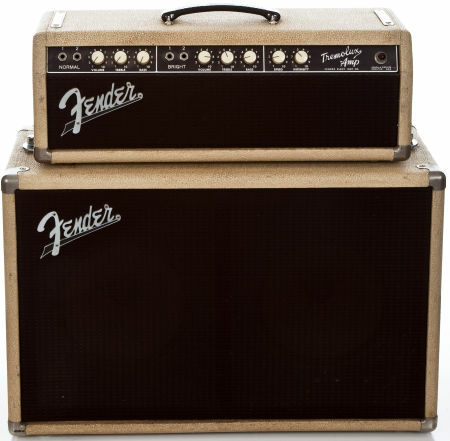 Only the higher powered models during the 1960-63 6G type Fender Blond/Brown amps have a presence control(Bandmaster, Bassman, Pro, Super, Showman, Twin & Vibrasonic would be the models). Any Fender 6G era amp specified below 35 watts does not have a presence control. For those that care, the 6G9A Tremolux is the same amp as the 6G11 Vibrolux combo. I have a vintage Tremolux 2×10″ cabinet that has been ‘reworked’. Were these cabinets totally sealed, or did they have porting holes in the baffle? Also, if sealed, did they originally have fill material, and what type? The 2-10 cabs are sealed the 1-10″ tone ring cab had the “floating Baffle” so it is ported around the edges. My 6G9 (no A or B) was 00845 KK on tube chart Factory installed 5881 and also a JBl D120 12″. Before whoever took over this site, my amp was the one posted here (since 1996) with the dusty rose colored wall behind it. I recently obtained a ’62 brown face Tremolux head. Some one had re-tolex black and silver grill cloth. When in 1962 did Fender begin to use cream/wheat combo instead of the Oxblood? Any experts out there? I realize it may be indeterminant. 60-63 Rough Blonde Tolex, 64 Smooth Blonde Tolex or Black Tolex, 64-66 Black Tolex only. Has anyone seen or heard of an early ’63 Brown face covered in Black telex? This amp looks really original, but it is a brown face w/ white knobs and black telex. It doesn’t appear to be a re-cover but thats hard to tell. 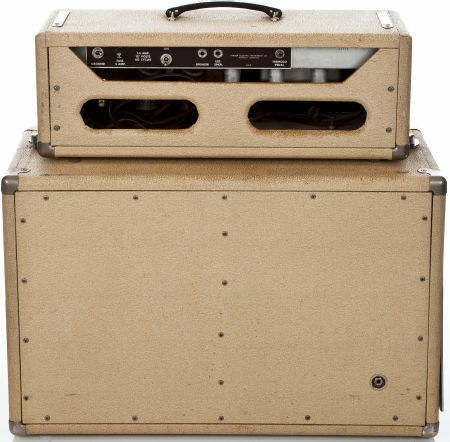 Technicaly does it matter ?…….possibly the most fearless amp ever built ? Thanks for all the comments, Gentlemen … All I know is, I would love to own an early ’60s Tremolux … I remember seeing and hearing them when they were brand new and have always wanted one. I guess I will be relegated to having a head built and adding a custom-built cabinet to, it as I am able. Any of you guys who have a Tremo are extra lucky people … actually, extra blessed of God. Good for you! Enjoy!